A collection of Antica Farmacista top selling fragrances in three, 100ml, diffusers. 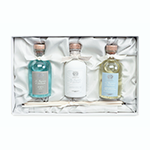 Antica Farmacista diffuser trio gift set consists of the following fragrances, Acqua Lush Palm, and Bergamot & Ocean Aria and is presented in a decorative satin lined, two piece box adorned with a rattan and palm leaf motif. An intoxicating green floral fragrance. Reflective of the exquisite natural beauty that exists just beyond the sea. Escape to a warm pacific breeze wafting through beachside Tahitian gardenia, dewy banana leaf and wind swept palms. The Acqua Home Ambiance Fragrances utilize antique inspired apothecary bottles, filled with fragrance, to permeate the air through the bottles' open neck and white birch reeds that are inserted to further diffuse the scent. Simply position the fragrance bottle in the room of your choice and uncork. Place the reed bundle into the neck and reverse the reeds every few days or as desired to enhance the scent. The Antica Farmacista fragrance will infuse the air and provide a lasting, constant and beautiful scent. Presented in a decorative satin lined, two piece box adorned with a rattan and palm leaf motif.